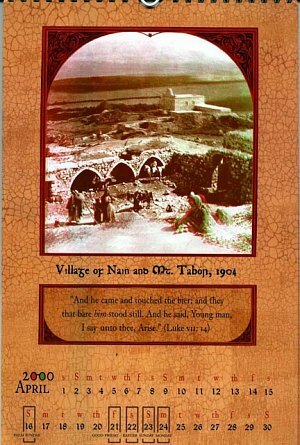 Images of the Holy Land have always been a popular subject, and in 1904 the company Underwood & Underwood produced a boxed set of Holy Land stereo images. Each consisted of a right eye and left eye view, which, when put into a two lensed hooded viewer called a stereoscope were transformed by the eyes and mind of the viewing person into images in fantastic three-dimensional relief. It's hard to believe that these fabulous 3-D photos were taken almost 100 years ago. Each one captures the spirit and essence of what life must have been like in the ancient world. These are destined to become rare collectables. 12 of the best 3-D images from the 1904 set have been beautifully reproduced for this unique & attractive calendar. Included are images of Baptizing in the Jordan River, Life on the Shore of Galilee, Nazareth, Jerusalem, Bethany, The Garden of Gesthemane in Jerusalem, The Church of the Holy Sepulcher, and the Church of the Nativity. The 12 fascinating images have been enlarged to 5.5" x 6" size, and converted to Anaglyph format, which allows them to be viewed with red and green 3-D glasses. Especially made for this calendar custom 3-D glasses have been created in the form of a cross. Printed and produced in Israel, in a limited edition, the calendar is an unusual collectable, and will make a wonderful gift for the new Millennium. 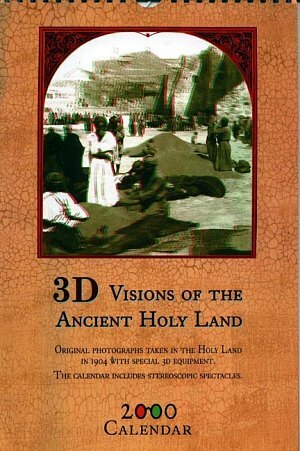 "3D Visions of the Ancient Holy Land" calendar has overall dimensions of 7.75" x 12", with a single page and image for each month, plus the cover, and an information page about the images.